Walk into any major shopping centre or plaza in Australia and you are guaranteed to come across at least one pop-up store. In fact, you’d be hard-pressed to not come across any. The concept of pop-up stores is currently one of the most popular trends in the Australian retail industry. Westfield describes the trend as a way to attract potential customers by providing opportunities and innovative ways to reach target markets and as they continue to rise in popularity, their numbers could potentially settle in the thousands as can be seen overseas. Pop-up stores are dominating the US and UK retail industries, contributing billions of dollars to their respective economies. The Centre for Economics and Business Research along with digital communications company EE conducted research on the trend and found that there are over 23, 000 people employed in pop-up stores. The outlets add 2.6 billion euros to the UK economy every year. Additionally they found that in the next 12 months, the industry will grow by 8.4 per cent. Alexander Babbage Inc conducted research in the US in which they found that pop-up businesses now form part of an industry worth $8 billion dollars (US) with an annual growth rate of 16 per cent. understands that pop-up stores in Australia appeal to retailers as they provide both low-rent and flexible options to promote products; an endeavour which is significantly easier to achieve in the US. Retailers have the option of choosing either short-term leases or a one-off opportunity like for a festival. Westfield, GPT and Lend Lease see the stores as a solution to vacant areas. The format has also been popular amongst online retailers who have a chance to operate away from a computer screen and reach older consumers. that the pop-up shop for the popular blog Design Files were on the money when they opened the physical store two weeks before Christmas. “Having an online store suddenly become a real store is a good strategy for them,” Mr Waller said. 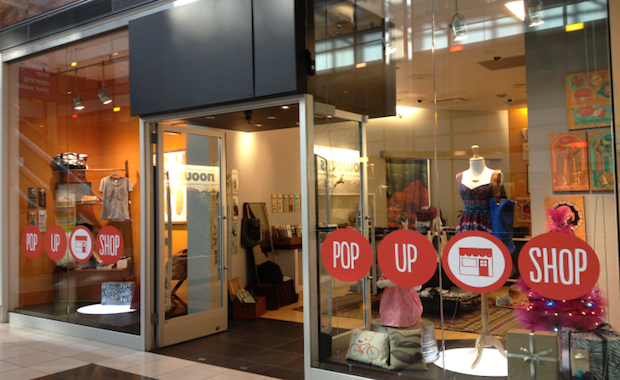 Pop-up stores are highly adaptable and can operate out of a diverse range of channels. One of the most popular pop-up store channels are shipping containers, which can be used when retailers are unable to secure fixed real estate. Being weatherproof, durable and modifiable also adds to the appeal of containers which cost $5000 and can also be rented. Recently, the benefits boasted by shipping containers have prompted the ACT Government to use the format for a village of pop-up stores in Westside at Acton Park. The park is described as “unlike anything Australia has even seen” and will be constructed using scaffolding and shipping containers. There will be a constant rotation of local cuisine on offer. Elsewhere, a shipping container mall dubbed Re:START was constructed in Christchurch, New Zealand after an earthquake destroyed the CBD. Second hand shipping containers were used to provide consumers with a safe and clean place to shop in. The containers were eventually moved to different area but still continue to operate. Shipping containers have also been used for retail purposes in Thailand and the UK. To be successful, retailers must secure the proper location for their store. While pop-up stores do well in major cities, operating in areas which don’t have a major retail presence, or a resort, can prove to be a struggle. However even if retailers are seeking to operate in major retail destinations, securing a location may be hard work due to some retailers staying for an extended amount of time. , told Smart Company that while it can be difficult to secure a spot, as the concept increases in popularity it will eventually become easier. “It’s always been hard, although it’s getting a little bit easier as some agents are coming around to the concept. Often it involves a lot of leg work,” Mr Williams said. The Business Lounge editorial team recommends researching locations and talking to real estate agents, council members and local traders when trying to find the right location.